Editor’s Note: This story is taken from the upcoming print edition of Working RE, in the mail now. Am I a Subscriber? No one needs to tell appraisers about pressure. Despite recent regulatory changes, such as Dodd-Frank, appraisers still face pressure every day. Instead of rabid mortgage brokers, like days gone by, today there is a new source of heartburn for appraisers: real estate agents. In recent years, appraisers have often been blamed for being “deal killers,” a code word for an appraiser who submits a value below the contract price. These days, it’s not uncommon for an agent or broker to call an appraiser, submit additional comparables for consideration, vigorously question the appraiser’s competence, and insist that the value of the property is higher than the appraiser’s independent opinion of value. Such pressure is likely in violation of appraiser independence but some agents take it a step further; they report the “bad appraisal” to their state appraisal board in what many view as retaliation for a lost deal. Such complaints are almost always frivolous and are frequently dismissed by state boards, but nonetheless, cause a litany of problems for the appraiser involved. Stacy Roberts (quoted under an alias because she fears retaliation), appraising 27 years, recently had an angry agent file a complaint against her with the Colorado State Appraisal Board. Roberts says the agent never submitted any additional comparables for consideration, likely because she did not have any. “Instead of submitting additional comparables, the agent sat down with her seller and wrote a letter making a series of very libelous accusations against me. They called me lazy and incompetent. I’m offended because I work very hard. I’ve been an appraiser 27 years and I know my business. The verbiage in this complaint was so outrageous that I was sure the State Board would realize what was going on and just toss it,” Roberts says. Instead of tossing out the complaint as she expected, her Appraiser Board pursued it. Roberts thinks one of the reasons might be because her Board is under the supervision of the Colorado Real Estate Commission. “I think it’s a problem because the Real Estate Commission is full of agents, so those relationships get a little too cozy. I was shocked that my Board was pursuing a frivolous complaint that had no foundation in reality,” says Roberts. In response to what she felt was retaliation by the agent for simply doing her job, Roberts filed her own complaint against the agent with the Colorado Real Estate Commission. “My complaint said what you might expect, that agents are up to their old tricks and are just using a new weapon against appraisers. I said that this woman had violated my appraiser independence and that we should not be subjected to that kind of harassment and pressure just because we don’t meet value,” says Roberts. The Commission’s response to Roberts’ complaint surprised her. An investigator for the Commission told her that he hadn’t even read her complaint. “He said, ‘You can’t file a complaint against an agent. You’re an appraiser you’re not allowed to do that.’ I was shocked! I thought I had the same rights that everybody else does. My complaint was legitimate,” says Roberts. Two months and several responses later, Roberts reports that the complaint against her is finally being dismissed and that none of the allegations were substantiated. Even though the complaint was ultimately dismissed, Roberts feels the situation with the Colorado Real Estate Commission needs to be addressed. Additionally, Roberts says that situations like this are happening with increasing frequency. “I attended two continuing education classes recently and being threatened by agents this way was the main topic of conversation among appraisers. Other appraisers are quite upset about this too. I gathered from the other appraisers that it was all verbal at this point, but this is still a significant problem,” Roberts insists. According to Roberts, speaking out about the problem is the first step to addressing it. “Appraisers need to feel that they can talk about it. They shouldn’t be scared of it. We all sit in our little home offices and feel like we’re alone and we don’t have a voice. I had every right to file that complaint and the Commission was out of line to refuse to investigate it. The fact that they didn’t is very disturbing. We just can’t have this type of pressure going on,” says Roberts. Richard Hagar, SRA, an experienced litigation consultant and expert on appraiser independence regulations, says that appraisers should be reporting any violation of their appraiser independence not only to regulatory authorities, but to the lender directly. Section 129E of the Truth in Lending Act mandates that: “It shall be unlawful, in extending credit or in providing any services for a consumer credit transaction secured by the principal dwelling of the consumer, to engage in any act or practice that violates appraisal independence.” According to Hagar, this means that appraisers have the power to stop a loan for a consumer’s primary residence if they feel their appraiser independence has been violated. Hagar also advises appraisers to file complaints with the relevant state and federal regulatory bodies, including the State Attorney General. “An important thing when filing a complaint is to make it concise. Do not write War and Peace! Your complaint must fit on a single piece of paper. These people are busy so if you write a Russian novel, they’re not going to pay attention to you. Do not file an email complaint either, write out a formal complaint on your own letterhead and send it in. You can use an online complaint form, but be sure it is written professionally. State clearly the specific regulatory violations that have occurred and describe the situation, but do not try to cram in all of the details. Look at your complaint like a marketing piece to get them interested enough to investigate and interview you further,” Hagar says. Finally, Hagar advises that in addition to complaining to state and federal regulators when pressured by an agent or broker, appraisers should also contact the National Association of Realtors if the individual involved is a Realtor®. In some cases, according to Hagar, state Realtor® associations may take action against unethical agents and brokers who attempt to pressure appraisers into meeting value. Hagar shares the latest on Fannie’s new rules including how its blacklist works, how Fannie Mae will be evaluating appraisers going forward, and what appraisers can do to stay out of trouble. Hagar shows you specifics on how to make the “correct” UAD choices to avoid “hard stops,” “fatal warnings” and “critical messages” and keep you in business. Today at 5 pm I received a package from DPBR regarding an appraisal I recently completed, nice start to the weekend. The seller/owner has filed a complaint with the State due to low value and loss of sale. How or why are the state agencies even looking at these complaints? The package I received from the state with my appraisal was missing 3 additional comps that were used in the report. The owner sited I used dated comps in the complaint but comps 4 and 5 w ere recent sales and comps 6 and 7 w ere active listings. These comp pages w ere omitted from the report sent to the state. Would this qualify as a fraudulent complaint? Do these individuals that serve on review boards not understand the different motivations with respect to value between appraisers, agents and homeowners? Of course they do! The deck is stacked against appraisers. I just had a complaint dismissed that was filed by a disgruntled homeowner who happened to be a lawyer. His complaint was filled with language about Reg Z and comparables that he deemed more appropriate. The compliance officer at the bank assured me that this was not their first dispute with this guy and I ultimately made him look stupid to my state board. 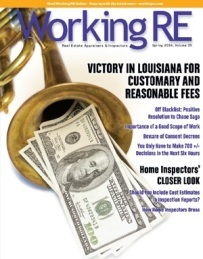 While this was rewarding, appraisers need more recourse for time lost and damaged reputations. My sympathies to the Colorado appraiser. Another excellent reason to make sure your work file dots all the EYES and crosses Tees. I’m surprised at the Colorado Board telling her she couldn’t file a complaint. I think ANY member of the public can files complaints. Perhaps they meant as a response or in answer to a complaint against her? The experts advice is great IF you know about the complaint in advance. Usually you won’t. I think I’d have filed a CFPB complaint about the undue influence; a CC to the lenders compliance officer and definitely a CC to the State licensing board. Its much harder for them to disregard your complaint when they see it has also been filed with a federal regulatory agency. If the ‘agent’ was not a Broker acting in their own brokerage, then another CC would have gone to the supervising broker. Typically we all try to avoid confrontations, but when agents start an unfounded trend of retaliatory complaints, then we MUST fight back with all we have. A lawsuit for recovery of all expenses (no matter how trivial) would be appropriate once the Colorado Board exonerated her. Small claims? Full court press back toward the agent. IF reputation was also damaged; OR E&O went up due to a complaint; OR work was lost by answering “Yes” to has a complaint ever been filed against you? Perhaps a broader lawsuit for libel or defamation would be warranted. A good reminder for us to always be prepared to consider new appropriate comparables, but to stand firm when data (not our egos) dictate that we do so. I had the very same thing happen to me but the complaint wasn’t dismissed and I’m in the penalty box. The complaint wan’t from the realtor but originated there. All of the supporting data from the complaint was given to the lender by the realtor who was disgrunteled over the loss of 6% of $1,010,000 sale or you might say he had $60,600 reasons to file a complaint.In over 20 years this was my first complaint and I went to an “Informal Hearing” with the State Board. There was over 3 hours of grueling questions by an attorney, two investigators, a Board Member, and others. When it was over It looked as though I have never done an appraisal in my life and it appeared I violated ever rule in the rule book. It was apparient they were out to make a point. After over 20 years of upholding every thing I could to remain unbiased, ethical, and honest in my practice over. My reputation was gone and I felt I had been hanged. The real estate agent went merrily along. I must state that now all real estate agents are like that and it would be unfair to group them with this agent.When you spend a life time building a reputation based on the honest practice of appraisals it is difficult to accept how easy it is to loose your license. Beware and thanks for sharing your story. I had almost the same sequence of events happen to me except it was review appraisers from a major AMC. Notice I said appraiser”s”. It was reviewed by committee, four reviewers from three different cities, none from the city of the subject property.First they questioned my sources on the comps I used. When they saw that was solid, they started suggesting comps that were older, less compatible than the ones I had used. These comps supported a higher value of more than 1.5 million. All the “recent” data, including the MC Report showed there had been some appreciation over the past year, but as of the most recent three months and current listings, the market had flat lined, in the beginning of August, atypical for this region! I refused to use the comps they suggested and raise the value. They removed me from their list and submitted my report to the state board. Still waiting to here from them. Prior to this, I had no complaints from this AMC for 14 years! They invited me to be a high dollar value appraiser and always called when they needed an experienced appraiser. The little mortgage broker pressure I had experienced prior to this was child’s play! It is a real pain to get a complaint, even if you are innocent. The preparation and the worry take an extensive toll on time, life and health. There is no easy answer. I just wish that the Appraisal Boards had the power to dismiss realtor and homeowner complaints immediately. (Unless the complaint is legitimate) According to this story, the realtors have someone that does that for them in Colorado. I have been turned in four times. Each time is a life event. Each time I go through my files and worry. Maybe my neighborhood percentages were wrong (Yes, I have seen appraisers get cited for that) Maybe they found some comp I missed. Maybe my land value was low or high in a tract subdivision with no land sales. On the other side of the coin, last time I was waiting for my case to come up at a board meeting, I started talking to the appraiser that was next in line, during a break. She told me a similar story as the Colorado story above, about how the realtor filed a complaint. She sounded convincing until I heard her hearing. Ends up the realtor was right. She refused to give any value to a large workshop/recreation room. her only explanation was that it was not permitted. Tax records did show it as permitted, but she said that was for another addition. Ends up that there was no way to know that. An investigator tried to research this, and could not determine what the permit was for. Either way, she should have given some value for it. The realtor value was supported by her comps, but the only comp she weighted was a comp that has an addition, but backed a busy road and had over 50% gross adjustments. I, as an Appraiser, am a professional and should be considered as such! In your article “New Pressure: Agents Filing Complaints” the only time that you capitalize Appraiser is the beginning of sentences. If we consider ourselves professionals, act like it and then maybe we won’t have to tolerate the abuses that we suffer! We need to change the terminology! Stacy Roberts did NOT “fail to make value” – she did her job and provided an opinion of value, based on relevant data and analysis. It’s nice when appraiser’s value opinion and the agent’s price opinion match, but they are two different factors. My response to questions like “Are you going to make value?” is consistently: “I always report value ——- how that relates to the agreed price is not my concern, but I will report my opinion of value based on what is happening in the market.” That has cost me a few clients, but has made others more loyal. That is a great concern. I have been under investigation for over a year with my state board because of a complaint from a realtor. I have been battered and dragged in the dirt with now end as of yet “over a year”. Talk about wanting to just quit! This would be the great state of Washington FYI. If the agent made “libelous statements” in her complaint, then the agent should be sued for libel for a significant portion of his/her net worth. Did she get paid for the appraisal???? On all sales transactions the broker gets a large commission. If you blow their commission they will retaliate. Too much effort to fight. If I see I can’t support the sales price, I turn down the assignment and another appraiser always supports the deal no matter how ludicrous. Why fight the system as our time and money is too valuable to fight when it is easy to JUST SAY NO to the assignment and move on. Many say fight and stand up but the cost is too high and so is the hassle. As long as many appraisers support every deal and are not held accountable, teh system is flawed. 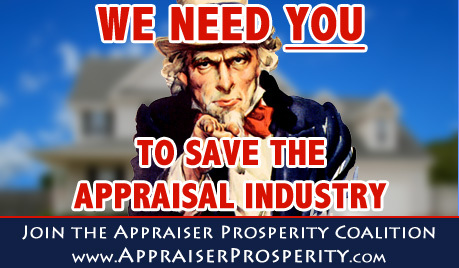 Many leaving the profession and are replaced by appraisers doing a business. Appraisers need to grow a set. As an appraiser I’m ashamed of the whining that comes from appraiser about how they can not handle the pressure people in the industry put on them. Grow a set and tell them to go fly a kite. This whining and inability to handle our own business like adults has cost us an entire industry. If you can handle it get out! You little girls are costing the rest of us who can handle our own business!!! At what point does the responsibility / pressure / aggravation make this job not worth doing? I wish you would fix the program to include the listings on the appraisal grid. It is a pain to have to go back and forth to the sales grid to make sure the descriptions are the same, such as C3, etc. As an active Broker, and a State Certified General Appraiser, I encounter situations almost every week where incompetent appraisers are hiding behind Dodd-Frank and lack the experience to complete the appraisal or will not budget enough time to do the work to provide a reliable report. Many blatently say that they would not get the work if it wasn’t for the AMC’s, and many have come right-out and have said that they never have appraised a property in this area before. Many mortgage appraisers are no longer appraising, they are filling out a form at the direction of an undewriter. 30 years ago we were not that appraising is both an art and a science. The “art” is long gone in mortgage appraising.